Discussing about using a computer, this book, without the use of jargon, demystifies Windows XP, broadband connections, PC configurations, various DVD writing formats and hardware, scanning, digital photography, e-mail management, and more. This book helps the PC novices to know about the PC easily. A Reference for the Rest of Us!. The world's best selling PC book for beginners is now updated to cover the latest hardware and software technologies. 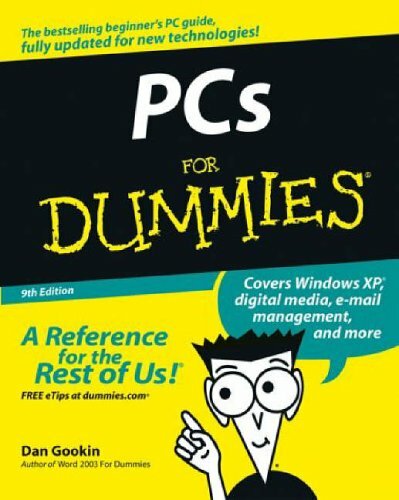 More than three million copies of previous editions are in print, making "PCs For Dummies" an undisputed bookstore champion. In this edition, veteran "For Dummies" Dan Gookin demystifies Windows XP, broadband connections, new PC configurations, various DVD writing formats and hardware, scanning, digital photography, e-mail management, and more. This book strips away the jargon and leaves the fun, enabling PC novices to get up to speed quickly and begin enjoying all the PC has to offer. Written by the author of the original "For Dummies" book, whose knowledge, writing style, and reputation are unparalleled in the industry. It walks the reader through using a computer in friendly, human and often irreverent terms, focusing on the needs of the beginning computer user; provides everything the beginner needs to know without bogging down in jargon and techno-babble. It is fully updated with all new coverage of Windows XP, PC maintenance, new PC configurations, digital photography and scanners, CD-ROM writing, e-mail, broadband connections, blocking spam, and more. It also covers the "fun stuff," like planning a trip online, playing online games, and making a Web page DAN GOOKIN (Coeur d'Alene, Idaho) helped launch a phenomenon when he wrote the first-ever "For Dummies" book, "DOS For Dummies" in 1991. His friendly, conversational style has taken the terror out of technology for millions of people around the globe; his books have been translated into thirty two languages, with eleven million copies in print. In addition to the eight previous editions of PCs For Dummies, he has written or collaborated on more than twenty five For Dummies books.